Home News & Opinion From the Magazine Meet Jonas Ho, Atlanta’s LED-lit evangelist of electric skateboards. About five years ago, Jonas Ho was watching YouTube videos when he discovered a novel way to spend the $500 burning a hole in his pocket: a battery-powered MotoTec skateboard. 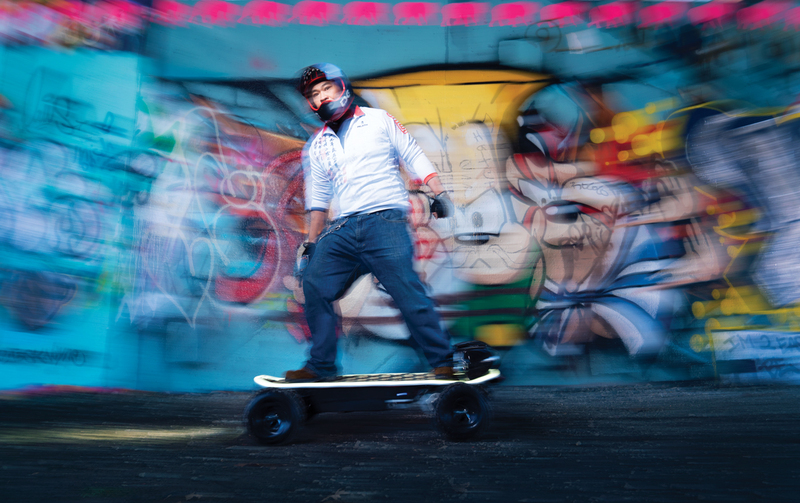 Since then, Ho, the owner of Noble House Tattoo in Stockbridge, has become a mad scientist of electric skateboards, turning his board into a 51-pound street cruiser lined with lights and capable of traveling up to 32 miles per hour on city streets. He’s even traversed up the side of Stone Mountain. 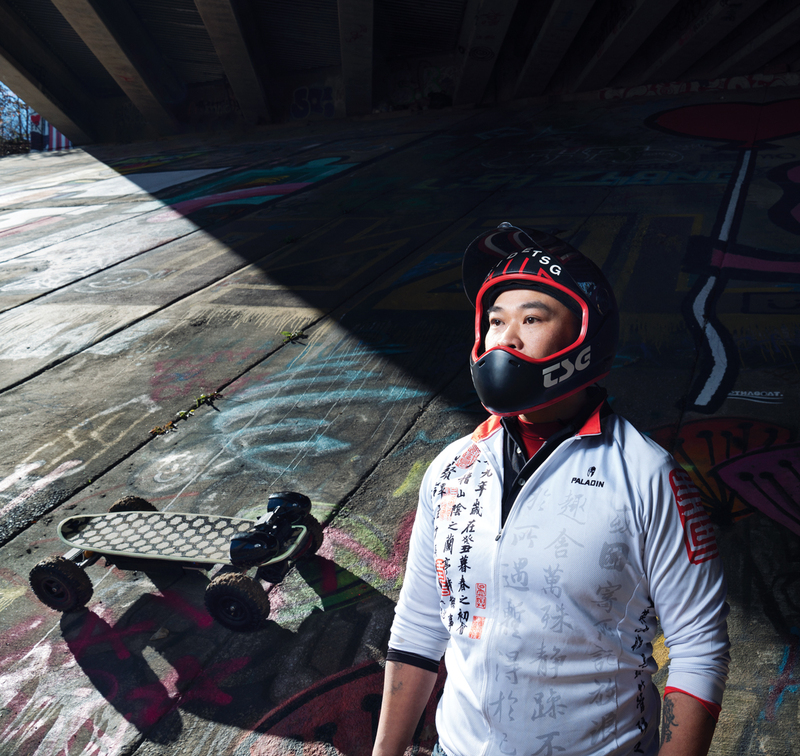 A familiar face during Atlanta Streets Alive and Critical Mass (the hundreds-strong group bike ride through Atlanta), Ho hopes to spread the gospel of e-boards—and even e-unicycles—to a city street near you. Ho, 42, had no prior experience with skateboarding before he bought his e-board. After purchasing a helmet, kneepads, and other protective gear, he practiced in Piedmont Park and other greenspaces to get comfortable with the machine. Ho drives to his Henry County tattoo parlor, but he’ll ride the e-board to Walmart down the street or to grab lunch. Ho, a member of E-Board Atlanta, a group that includes people who commute to work or transit using e-boards and e-unicycles, says the community is more accepted now than two years ago. “When people see an electric skateboard, they go nuts,” he says. “It’s like a UFO.” However, he occasionally receives pushback from “mammals—middle-aged men in Lycra”—on the Atlanta BeltLine.